The Dodge Durango is like no other SUV on the streets – it's America's fastest, most powerful, and most capable three-row SUV. Our Eide Chrysler sales team is ready to help you drive home in this strong SUV that offers the space and comfort your life busy requires. Here's what you need to know about the new 2018 Dodge Durango! buy for $37,349 (over $5,000 off MSRP). 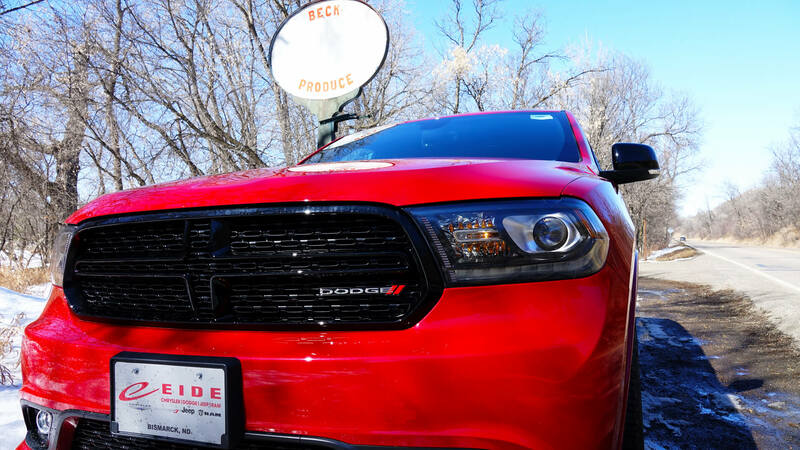 The Dodge Durango certainly packs a punch that's ready for North Dakota adventure. You'll feel the raw power of the available 5.7L Hemi V8 engine and the iconic soul of a Dodge Brand muscle car. With the Durango, you get a triple threat – amazing power, impressive towing capacity, and outstanding fuel economy. The Durango provides best-in-Class V6 and V8 towing, allowing you to tow up to 6,200 lbs with the standard 3.6L Pentastar V6 engine. When equipped with the available 5.7L HEMI V8 engine the Durango offers trailer tow capability of up to 7,400 lbs. In case you need even more towing capability, the Durango SRT can tow up to 8,700 lbs. Muscular and refined, the Durango owns the road. Cruise down the North Dakota highways this summer with a signature LED racetrack taillamp, available LED daytime running lamps, and 12 available exterior colors. Also available are six available grilles, decorated with the signature floating split-crosshairs with dark or bright accents, keeping you always moving forward. 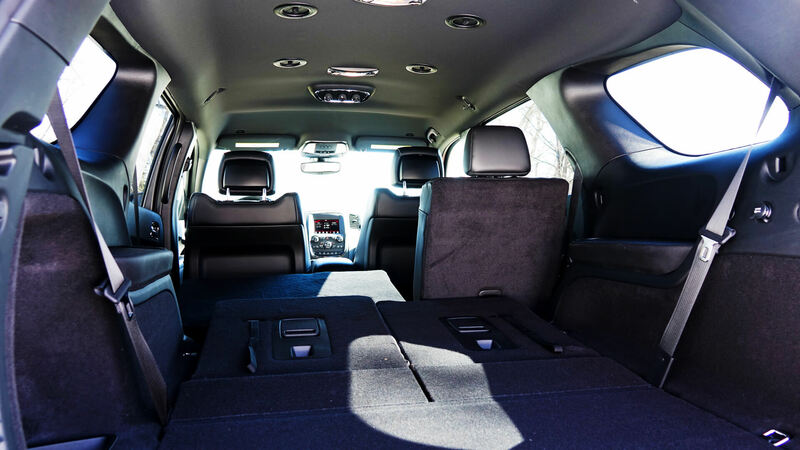 The 2018 Dodge Durango offers uncompromising cargo space, with up to 84.5 cubic feet of cargo space when you fold the available 60/40 Fold & Tumble second-row seat and the available 50/50 split-folding third-row seat. 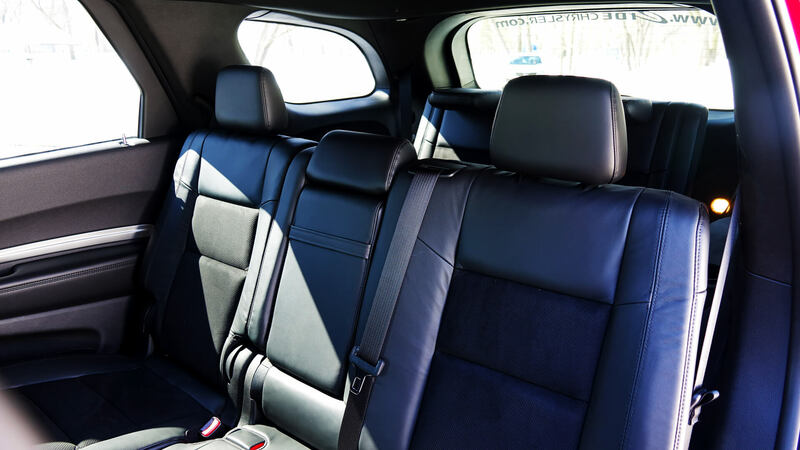 You'll be comfortable in your choice of leather-trimmed or plush cloth seats, and we doubt you'll complain about the front-row heated and ventilated seats with four-way lumbar adjustment. Everyone in the back will be happy too, thanks to the available dual 9-inch screen Blu-ray and DVD Entertainment System with High-Definition Media Interface (HDMI). Or let them play a game by connecting their game console. Screens fold down to keep them scratch-free. Durango offers two new Uconnect® systems — the Uconnect 4 and the available Uconnect 4C NAV. The Uconnect 4 includes a 7-inch touchscreen, Android Auto™9 , Apple CarPlay® support10 , integrated Uconnect Voice Command, Bluetooth® Streaming Audio and SiriusXM® Satellite Radio2 . 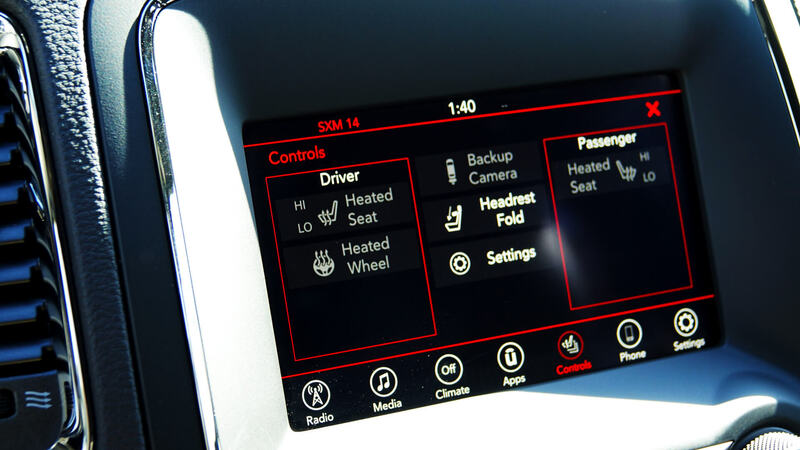 The Uconnect 4C NAV increases the size of the touchscreen to 8.4 inches and adds SiriusXM Guardian™11, Navigation, SiriusXM Traffic Plus12 and SiriusXM Travel Link13. 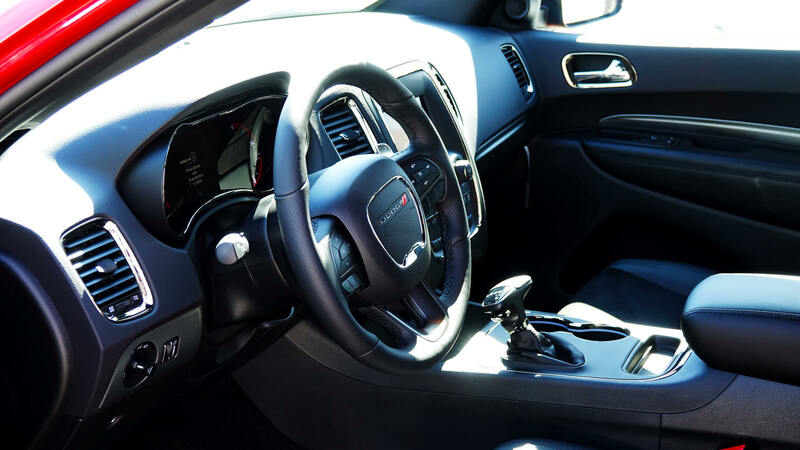 With more than 60 standard and available safety and security features, you'll drive confidently in the Dodge Durango. We take your safety and security seriously. The available Blind Spot Monitoring System helps watch your blind spot zones so you can drive knowing you are in good hands. Electronic Stability Control monitors your steering and vehicle motion to give you confidence on every North Dakota curve. Avoid parking mishaps in Bismarck with the standard ParkView® Rear Back Up Camera11 and available ParkSense® Rear Park Assist11 or ParkSense® Front and Rear Park Assist Systems12. There's even more to see, so contact Eide Chrysler today for a test drive. 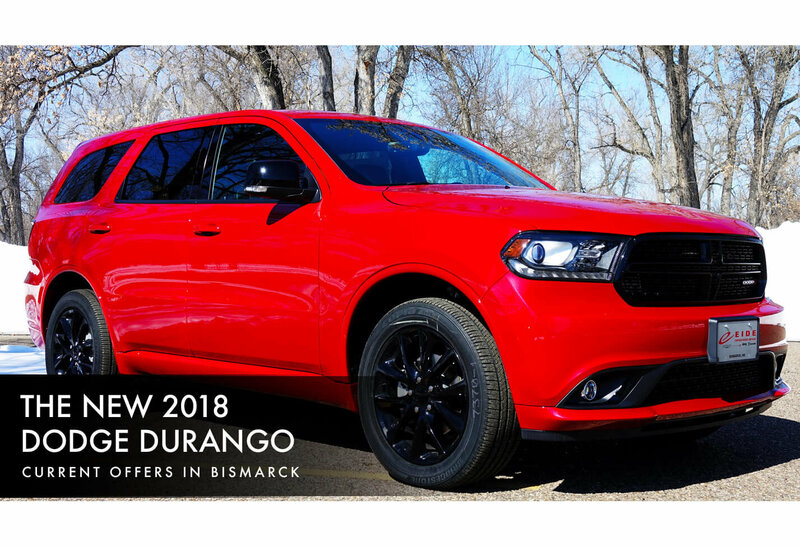 Don't miss out on our current spring offers on the 2018 Dodge Durango – stop by soon!